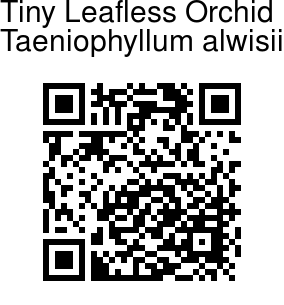 Tiny Leafless Orchid, as the name suggests, is a very small leafless orchid dwelling on trees. Roots are green, 1-2 cm long, trigonous or nearly round, 1.5-2.8 mm in diameter. Spikes 5-10 mm long, from the centre of the reduced stem, 1-3 flowered; flower-cluster-stalk glandular, thickened towards tip; bracts 1.1-1.25 x 0.7-0.8 mm, ovate, pointed, glandular with a callus on the back, distichous, persistent. Flowers are nearly stalkless, 5-6 mm long, creamy white. Sepals and petals united into a tube, 1 mm long; free parts of sepals 0.9-1 x 0.4-0.5 mm; dorsal sepal oblong-lanceshaped, blunt; lateral sepals oblong-lanceshaped, pointed. Free parts of the petals 0.7-0.8 x 0.6 mm, ovate, pointed. Lip 2-2.5 x 0.7 mm, ovate, blunt with a recurved, delicate mucro at tip; no side lobes; spur 1 x 0.6 mm, oblong, blunt; column 0.8 x 0.5 mm, stigmatic arms oblong, blunt. Anther at branch-ends, 0.5 x 0.4 mm, unequally 4-locular; pollinia 4 of 2 unequal pairs, disc elliptic. Ovary 2 mm long, 9-ridged. Capsule 10 x 2 mm, oblong, curved, 9-ridged. 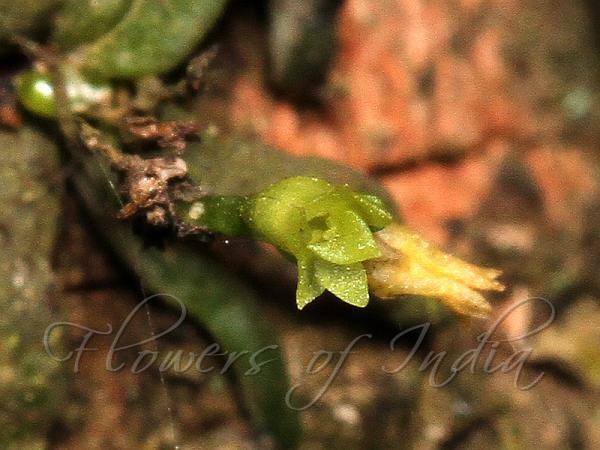 Tiny Leafless Orchid is found in Peninsular India and Sri Lanka. Flowering: September-March. Identification credit: P.S. Sivaprasad Photographed in BSI Botanical Garden, Yercaud, Tamil Nadu.